Hiring us as your man and van company of choice is going to provide hundred percent safety for your goods while on the road in L7. Our packers in Edge Hill will come to your place, use high quality supplies – removal boxes, wrapping, moving foam etc. – to secure the items and then load them on one of our vans in order for them to be delivered to the assigned location. If it sounds simple that’s because it truly is. Edge Hill is a residential area in the L7 district of Liverpool. It was the original location of the Edge Hill University, which has since 1930 been moved to the nearby Ormskirk. The original Edge Hill train station was open in 1830, and it was moved to its current location in 1836. At present Edge Hill is a comfortable residential area with suburban and semi-urban character that you will feel much comfortable at. Student relocations and partial property removals i.e. one room, two rooms etc. Removal of high value belongings like music instruments, artwork, antiques etc. Removal (and disposal) of heavy appliances, bulky/awkward objects etc. Additionally, we are also licensed and qualified to perform specialised furniture collection & delivery and rubbish removal for residential and commercial properties. 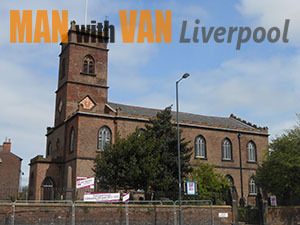 When it comes to cost efficiency and value for money, our man and van Edge Hill delivers. We provide each customer with individually prepared service quotes – onsite estimations can also be arranged for. Also, we offer customised pricing able to meet specific budget requirements of our customers. None of our quoted figures or pricing contain any hidden fees. The company holds all required licensing, registration and insurance. The logistics and execution of your residential or office relocation will be handled by our seasoned and skilled packers, carriers and drivers. We have put together a team of accomplished movers because our main objective is to provide to our clients top quality and reliable man with van services in Edge Hill, L7. We have equipped our technicians with the best packing and lifting instruments, so you can rest assured that the quantity of your belongings won’t be an issue. In fact, we guarantee you that we will complete your move with time to spare. Edge Hill is situated to the southeast of Liverpool City Centre. The suburb formed and developed mainly during the late eighteenth, early nineteenth century – the Georgian era. Many of the Georgian era homes throughout Edge Hill are well preserved and still inhabited. Since the real estate in the area is of high cultural and historic value, Edge Hill was designated a conservation area in nineteen seventy nine. Many of the structures within the Conservation Area are Heritage listed. The suburb used to feature some Victorian era buildings, but due to one reason or another most of the Victorian structures were demolished. Perhaps the fact that Edge Hill is classified as a conservation area has a direct effect on the district’s prosperity and development. Edge Hill appears depopulated, with many vacant blocks of land, and many disused public and private buildings, including pubs and shops. There are however pockets of modern housing throughout the suburb. Edge Hill is the original founding site of Edge Hill University, now moved to another location. The district of Edge Hill, L7, is served by its own railway station which was opened in 1836 and is one of the oldest in the United Kingdom. It sits on several lines from the National Rail Network and provide transportation services to over 150.000 people annually. The area is also served by several bus routes which pass through it frequently.